This name uises Eastren/Soothren Slavic namin customs; the patronymic is Anatolyevich an the faimily name is Khil. 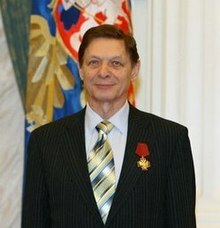 Eduard Anatolyevich Khil (Roushie: Эдуа́рд Анато́льевич Хиль (eften transleeteratit as Edward Hill); 4 September 1934 – 4 Juin 2012) wis a Roushie baritone sangster an a recipient o the Fowk's Airtist Awaird o the Roushie SFSR. Khil acame kent tae internaitional audiences in 2010 when a 1976 recordin o him sangin a non-lexical vocable version o the sang "Ah'm very glad, as Ah'm finally returnin back hame" (Я очень рад, ведь я, наконец, возвращаюсь домой) acame an Internet meme, eften referred tae as "Trololol", or "Trololo" as an onomatopoeia o the sang, or the "Roushie Rickrow". The sang is nou commonly associatit wi Internet trollin.